This workshop continues with a shamanic focus on animals in shelters that Carol and Dan began two years ago in Los Angeles. This September workshop will be held at the South Central Animal Care Center near southwest Los Angeles. 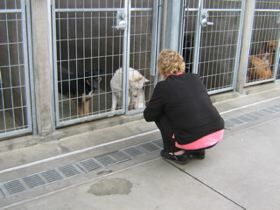 Working with the animals at the South Central Animal Shelter, we will explore how to apply various healing methods, e.g. soul retrieval, extraction, recovery of power (animals), and mending the torn thread weaving animals with humans. This is a unique area in applied shamanism. It is part of the ongoing pursuit of doing shamanism without borders. In this case, we move beyond the customary human-to-human healing situation to that of human-to- animal healing. Most of these animals have arrived to the shelter due to serious neglect and/or the inability of their human guardians to provide them with food, shelter, and a caring environment. At the shelter they are in a transition stage with the hope that they will be adopted. Some animals, however, have experienced such trauma that they shy away from the human touch or withdraw their trust that humans can provide an enduring bond with them. In some cases of soul loss, the animals are simply unable to ‘present’ themselves for potential adoption. With the aid of our own Helping Powers, we can offer healing where appropriate and we can plant the seeds for a new human  animal partnership. We can summon their own Guardian Spirits to surround them in a Web of Power. And we know from past experience, when one in the shelter is positively affected, news of this difference spreads among others in the shelter. As with humans, they bear witness to the arrival of the Invisible Spirits. From prior shelter work, we know that these interventions can make a difference in the overall process of people looking for an animal at a shelter and the animals ‘presenting’ themselves for adoption. And when the Doorways are truly open, sometimes the ‘lost’ animal can communicate important information as to the location of their homes in ordinary reality. There is no end to the possible positive consequences that can occur when shamanic tending is done with these animals. This workshop will be useful also for those seeking to mend the torn web between humans and their companion animals; it will be useful for those wanting to understand how to bring a more active shamanic partnership into their own lives with their animal companions. A portion of the proceeds from this workshop will be donated to this particular shelter  this is simply another way of supporting the work of these shelters and our gratitude to the South Central Animal Care Center for allowing us to explore and practice shamanism at the shelter. Enrollment: Due to the size of the shelter, enrollment is limited in this workshop. If you wish to participate, we recommend you register as soon as possible to reserve you a space. Location: South Central Animal Care Center, 3612 S. 11th Avenue, Los Angeles, CA.